It’s time! 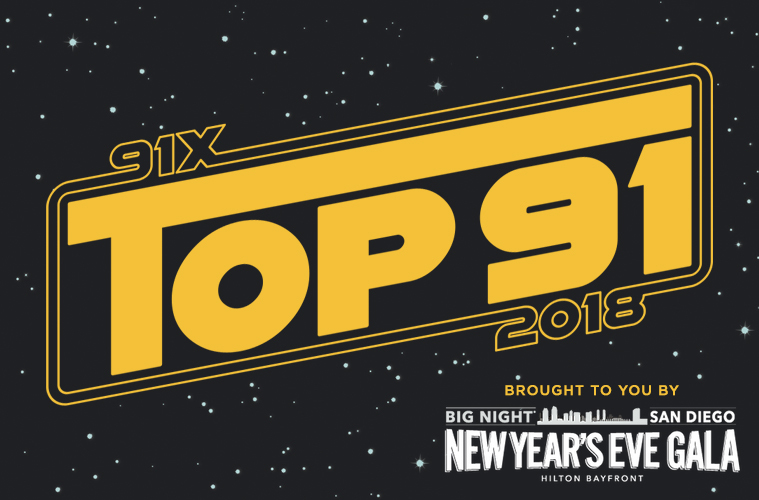 Vote for your favorite songs from the year, and help us craft the 91X Top 91 Songs of 2018. The tradition continues…every year since 1983, 91X has asked for your votes, compiled the list, and then, on New Year’s Eve, we count down the Top 91 songs of the year. 700 songs that define the sound of 91X over the course of 35 years…leading right up to our “traditional” countdown of the top 91 songs of 2018 on New Year’s Eve. It all starts tomorrow morning, December 28th at 6am. Brought to you by Big Night San Diego, San Diego’s biggest New Year’s Eve party at the Hilton San Diego Bayfront. All drinks included all night! Plus, multiple floors and rooms with entertainment and all drinks all night. Did we mention all drinks and included for the entire night?! Big Night San Diego New Year’s Even Gala is THE place to be to ring in 2019. Use promo code ‘91X’ at checkout when you buy BNSD tickets for a discount! Click HERE to enter to win Big Night San Diego New Year’s Eve Gala tickets and a room for NYE at the Hilton San Diego Bayfront. Everyone who votes in the Top 91 of 2018 is automatically entered to win two 2019 Lawn Passes at North Island Credit Union Amphitheatre – good for Lawn Admission to ALL outdoor summer concerts ($299 value per pass)! Check out the list from previous years HERE!